When creating aliens, I look for inspiration right here on Earth. I just celebrated my “Don’t Panic” birthday (42) this month, and I’m still discovering new and weird animals to inspire me. This isn’t a recent scientific article, but it’s new to me. The Elysia chlorotica is therein described as a “lurid green sea slug” that steals genes from the algae it consumes, making itself part plant and part animal, becoming photosynthetic and able to subsist on sunlight for the rest of its life. 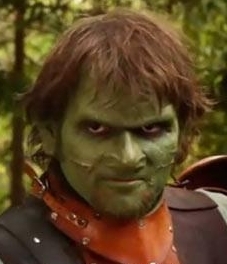 “Rilk” from JourneyQuest, portrayed by actor Jesse Lee Keeter. It’s been suggested that the orcs in this fantasy world are photosynthetic, and turn darker green the way humans would “tan” in sunlight. An alien life form that looks humanoid, but has green skin and needs sunlight to stay alive. This could have several implications in an action/adventure plot, if the alien is captured or covered up in some way. Or what if the alien is traveling in space or living on a space station? How much light do they need, and how do they get it? Do they carry around flashlights for a snack? Or how about an alien with the ability to change its appearance or even its basic biology by using genes obtained from consumed plants or animals… or people? That one has sinister implications. The morphing villain who looks just like your friend/crewmember/lover has been used many times in science fiction. This would add a gruesome consumption component and a scientific basis for the ability to assume the appearance of others. But I’m thinking it doesn’t necessarily have to be a monstrous character. It could be used for good, as well. Almost a kind of superpower. Need to charge a battery? Eat an electric eel. Need to fly? Eat a bird. Need to breath underwater? Eat a fish. What if every alien of this chimera race looked completely different, based on each individual’s diet? Could they control which genes they absorbed, or would they have to be careful what they ate in order to remain the person they wanted to be? I love to eat carrots and sweet potatoes, so if I were one of these aliens, would my skin be orange? If you could, would you reconstruct yourself with plant or animal abilities? Which ones would you choose? J.L. Hilton is the author of the Stellarnet Series published by Carina Press, including Stellarnet Rebel (January 2012) and Stellarnet Prince (November 2012), and she is a monthly contributor to the Contact-Infinite Futures blog. She makes cool wearable things that are featured in the books Steampunk Style Jewelry and 1000 Steampunk Creations. Visit her at JLHilton.com or follow her on Google+, Facebook, Twitter, Tumblr, Goodreads and deviantART. It’s an interesting concept and it does make sense, that if we were to have aliens, they might take on the qualities of what they eat. It might be interesting to setup an ability to turn into any animal you wanted based on the genetic material available around you. Hmmm. Interesting thought for a story! Invisibility! Okay, I don’t know of any animals that do that, but maybe gnawing on a chameleon would be the next best thing 😉 I do love how the smallest little thing can get us started on characters or plot.